Sorry if that was a scary all caps opening line, but I realllllyyyy doooo. In fact, I'm on a hunt to visit as many theme parks as I possibly can throughout all of my travels. I'm definitely a Disney girl at heart, but let me tell you, Hershey Park is a real good time. While one is the happiest place on earth...the other is by far the sweetest (so much chocolate you guys)! For all of the chocolate lovers out there, I highly recommend a trip out to Hershey. I have to start off by saying that the character meet and greets were my absolute favorite part of Hershey Park. There were just so many characters - Hershey Bar, Kit Kat Bar, York Peppermint Patty, Jolly Rancher...and that's really just naming a few. They made for so many fun photo ops and best of all (at least when we went) there were no lines to meet them! They were seriously the CUTEST - but they also made me crave some chocolate stat (so I guess they're definitely onto something there). If you ever get the chance to visit, I'd say a few snaps with these sweet characters is a necessity. Of course there were lots of rides, too. 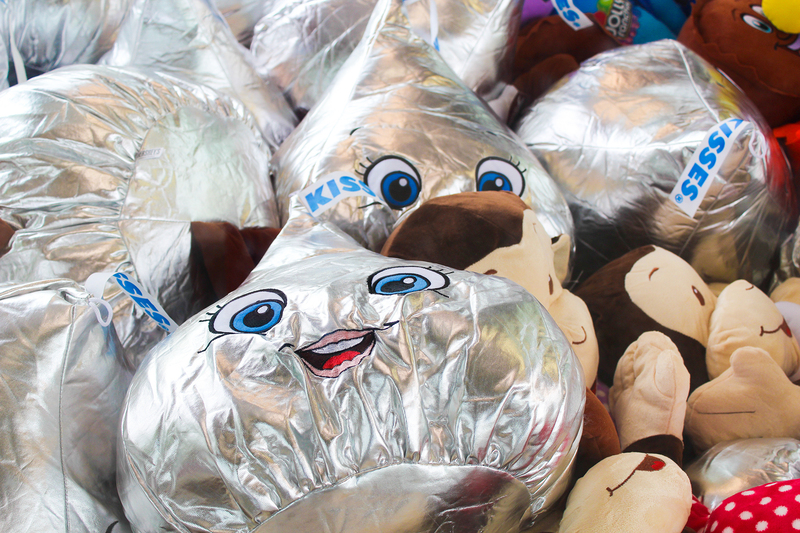 The height indicators for rides ranged from a Hershey Kiss (lowest height) to a Jolly Rancher (tallest height). Good news you guys, I was a Jolly Rancher. I'd say there is definitely something for everyone at Hershey Park. Whether you're into extreme rides or more milder ones, you've really got options. Plus, there's an in park zoo for those who aren't really into rides at all. I'm tellin' ya guys, lots to do! And if you go when it's warmer out, be sure to check out the water park, too! Right outside of the theme park is another popular visitor spot called Hershey's Chocolate World. If you ask me, that's a whole day experience in itself. There are lots of activities you can do inside and there's even a free chocolate factory tour ride with a piece of chocolate to sample at the exit. I seriously loved this. It was so fun and informative. Plus, you get to see some singing cows in there so it's pretty hard to pass up on that! At Chocolate World we also watched a 4D chocolate show (primarily geared towards kids), took a chocolate tasting class (yes, we are totally chocolate connoisseurs now), toured the city of Hershey on a sing along trolley, and even got to make our very own candy bars! So pretty much, if you hate chocolate, this obviously isn't the place for you. But if it runs through your veins like it does for me, it's all just a really fun time. A unique experience for sure! And there's still even more to see throughout the city. We popped by the Hershey Museum and Hershey Gardens which we really enjoyed, too. I loved that there were different places to explore there other than just the theme park itself. Overall, I had a wonderful vacation here and I would definitely go back again. If you ever get the chance to visit this whimsical town, be prepared to crave and eat a lot of chocolate because come on, you're in Hershey! P.S. Can you spot the Hershey Kiss in the image above? You'll find these cute wrapped chocolate kisses on top of the lamp posts and street signs throughout the city. I mean, does it get much sweeter than that? Wishing you all safe and happy travels, friends!